The Sumner versus Schiff spat is going the rounds, and can be seen in the video below. Scott B. Sumner is a market monetarist who blogs at Money Illusion.com, and advocates nominal GDP targeting, the latest neoclassical fad. Peter Schiff spins a vulgarised version of Austrian economics. Of course, Scott Sumner makes a number of good points. To defend his position, Schiff falls back on the verbal legerdemain of using the virtually archaic definition of “inflation” as an increase in the money supply. When Schiff changes the accepted meaning of “inflation” used in the comments of his opponents, he is simply committing a fallacy of equivocation. Secondly, Schiff’s claim that price inflation is actually much higher than the official figures, and that therefore real GDP has been negative since 2008 appears to be based on the alternative inflation figures at ShadowStats and their alternative real GDP estimates. “The Trouble with Shadowstats,” June 1, 2013. While I have used ShadowStats myself in the past because it provides a useful graph of U6 (a better measure of US unemployment), the method used for calculating their alternative inflation measure appears questionable. 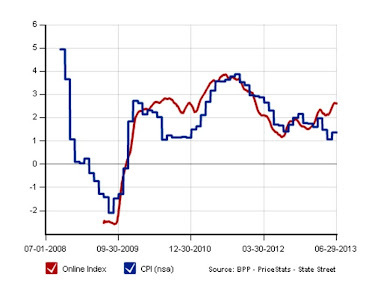 Furthermore, the Billion Prices Project at MIT data confirms that the official CPI estimates are a reasonable measure of inflation since 2008, as we can see below in the graph (in the red line). To Live is to Think: Thoughts on Philosophy, Culture and Politics. My latest post over there concerns Edward Feser’s review of Ray Kurzweil’s book How to Create a Mind: The Secret of Human Thought Revealed (New York, 2012). Thanks, will add it to my reading list. The method is just to stick on an arbitrary number. It's not really a method at all. It's just BS. 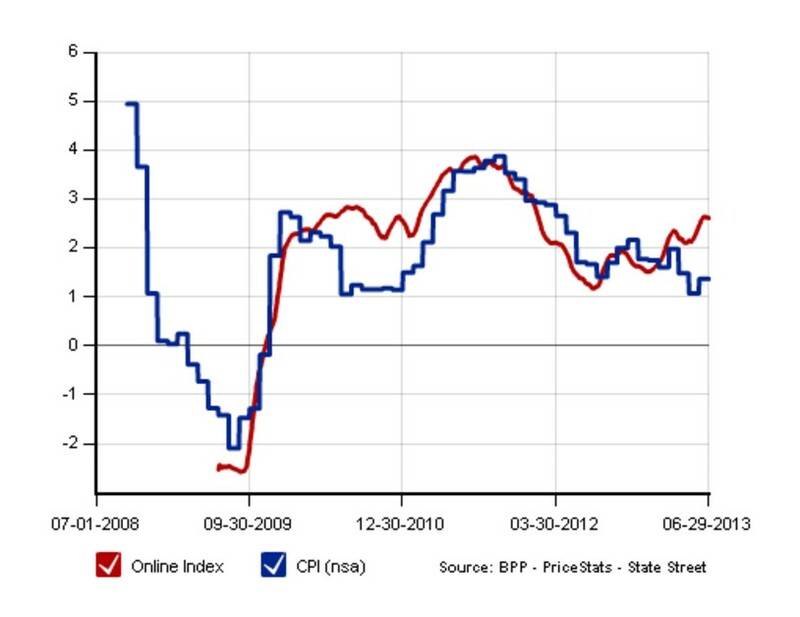 There are independent estimates of inflation and they track the Fed figures closely. There's no conspiracy here. Schiff is a seriously dodgy guy and he's been known to just make stuff up when it helps him sell his gold. The fact that Austrians don't ring-fence him says to me that they are a majorly untrustworthy bunch who are perfectly happy to endorse shysters. Peter Schiff's Dec. 7 op-ed, "The Fantasy of a 91% Top Income Tax Rate," included some faulty data due to a misreading of IRS tax tables. In 1958, an 81% marginal tax rate applied to income of $140,000 and the 91% rate at $400,000 for married couples, which would correspond to income levels about eight times higher today. The article misstated the income thresholds and the comparison to income today. In the same year, roughly 10,000 of the nation's 45.6 million tax filers had income subject to a rate of 81% or higher. The number is an estimate and is inexact because the IRS tables list the number of tax filers by income ranges, not precisely by the number who paid at the 81% rate. The original article said the number of such filers was 236. Also in 1958, about two million filers (4.4% of all taxpayers) earned the $12,000 for married filers needed to face marginal rates as high as 30%. These Americans paid about 35% of all income taxes but could not all be defined as genuinely wealthy. The article misstated these numbers." Yeah, the Billion Prices Project@MIT data blows Schiff out of the water. Have added a nice graph to the post. The funniest thing about ShadowStats is that they claim that real inflation is really high, yet their yearly subscription costs 175$...the same price they had 7 years ago. Why would you call NGDP targeting a neoclassical a fad, LK? Surely its better than the Austrian approach. What exactly is wrong with it? Although we have had this conversation before, if you define precisely what you mean by NGDP targeting, then I'll respond. Nominal Gross Domestic product Level targeting, where the central bank sets an explicit target for the level of NGDP year to year. and makes up for shortfalls by accelerating QE by however much is needed, buying the entire bond market if need be several times over,( if liquidity preference is enormously high and velocity is supremely low) to stimulate the economy. An NGDP level target is better than targeting inflation rates because taking only the RATE of inflation ignores the past, and is better than a price level target because it ignores supply side noise. "Come to Sumner's blog. You might find it interesting"
Will take a look. Perhaps my "inner" monetarist will shine through!! lol. Sumner really is an apt successor to Milton Friedman; another economist enjoying a healthy, celebrated career without ever managing to be right about anything. So even if you're a monetary economist who cannot correctly identify what constrains bank lending, there is still hope for you! Although I do see where some people are coming from with regard to Milton Friedman, not all of his scholarship was completely in the wrong. He made a lot of erroneous forecasts, but the case made in his joint work with Anna J. Schwartz, A Monetary History of the United States, 1867 to 1960, despite having it's arguments presented in a more extreme way to the general public than it actually was in the book, is still a monumental achievement in economic history. It isn't perfect, but I don't think that Milton Friedman had zero intellectual integrity, although I do disagree with him on a lot of things. I agree. While much of Friedman's work suffers from bad faith and disingenuousness, the monetary history he wrote with Schwartz is an impressive piece of scholarship (albeit it unhelpful to understanding the Great Depression). If only Friedman had focused more of his attention on economic history, instead of promoting monetarism, libertarianism, and movement conservatism! The reason why QE has not produced inflation is because the Fed has simply satisfied the dramatic rise in the demand for money prompted by the 2008 financial collapse. The problem with current monetary policy is that the Fed has a limited tool set. It can only influence the supply of money but not what people do with that money (a.k.a. the demand for money). The Fed cannot directly compel people to spend and invest unless it is granted control over fiscal deficits and surpluses. Such new tools will enable the Fed to expand and contract the supply of money through monetary flows in the real economy.